Just when I think I've had a series in this marathon set a high bar, another one comes along and throws that idea into chaos. The series in question today is Guilty Crown, and for all its oddities, it was excellent. Lets see what is inside Guilty Crown's soul, shall we? Interesting. Not sure where this is going. Hare doesn't get any screen time. This reminds me of a less brutal Neon Genesis Evangelion. Ha, he's the president of the school now. Is it really like that? Yes, yes it is. The world of Guilty Crown is an interesting one. Twenty minutes in our future, Japan has been utterly destroyed by a virus that swept through Tokyo. Since then, Japan has become of a dystopian mess under the surface of the nice public face they have. The virus, the apocalypse virus, continues to ravage humanity with little hope of ending. Our protagonist, Shu, is a normal kid (Again? Come on anime) who falls into the conflict between the dystopian government and rebel group Funeral Parlor. In the process, he is injected with a viral drug that gives him the power to retrieve a physical manifestation of a person's "heart" by reaching into their chest. As usual, this is pretty absurd already, but it also carries big consequences as the series will show us. The world, while fantastical in nature, is carefully conceived such that the suspension of disbelief can cover most problems. Some spoilers in this paragraph. It is important to point out that this series, like several anime, goes sideways in its plot. To be more clear, the story starts out one way and then rapidly changes direction (which has technically happened three times in this review marathon already). This show starts out like pretty standard anime fanfare and by the time you reach the plot shift I've mentioned, it systematically rips you to pieces. Not just because you feel betrayed by what you're seeing on screen, but because the plot justifies the change in a way. I found myself reluctantly agreeing sometimes, thus making me feel like a horrible person. It is very difficult to induce that sort of self loathing in the viewer of all people. As the plot continues, it explores some very enticing themes surrounding the usual coming-of-age story. I can't say I've seen a show tackle such a dark way of evolving a character in this way. There probably has been, but I've never seen it. The plot is extremely effective at showing Shu as he goes through the trials the series forces on him. He might not be the most relatable character sometimes, but you can always understand why he does what he does, even if his reasoning is flawed. Small ending spoiler (mostly hinting at it). This one is a big personal opinion of mine, but the ending for this series did something Japan never quite does: it got it just right. Without too many spoilers, the series doesn't end on a sappy high note or on a terrifyingly depressing note. It manages to finally show us that Shu was able to use the trials he experienced and his love for Inori to finally come to terms with himself and what he'd done. I didn't feel sad or happy, I felt content. It ends such that there are little-to-no questions, but it is bold enough to stay its course and not compromise on its themes. End spoiler danger. In sum, Guilty Crown isn't afraid to take chances in the plot and it's presented such that it never feels stale or over-the-top. It weaves a tale of darkness, death, and betrayal with a story of redemption, love, and sacrifice in a way that will appeal to a wide range of audiences. This series can be absolutely depressing. Make no mistake. This isn't a bad thing for myself, but it might not resonate with people of the more "glass half-full" variety. You should not watch this series when you need to get happy, do not. This depression manifests when the usually predictable plot goes full psycho on you and starts pulling punch after punch on you. On another note, people might be a bit displeased with the absurdity of some things in the series. The apocalypse virus is the unobtainium of this universe and it fuels every facet of the show from the protagonist's power to the strange crystals that appear. This mystical element just sort of needs to be accepted at face value for the plot to move on. Furthermore, Mana being infected with the virus and becoming a creepy raging psycho-socio-path is compelling, but it makes little-to-no sense. This ties into the absurdity of the overarching "natural selection" plot, which in-and-of-itself is pretty bonkers. Speaking of characters, this series is a bit short in the character department, although not for lack of trying. Most of the supporting cast gets barely any introduction and they don't get a back story, which makes them difficult to relate with. The main cast gets enough, but even then the protagonist, Shu, can be difficult to relate with when it is critical for the viewer to do so. As such, sometimes it feels a bit hallow when the characters do make choices. Apt examples are present throughout the series where characters do something that seems totally off-the-wall nuts (this usually ends badly for everyone). Some of the decisions that characters make in the series still don't make sense to me. 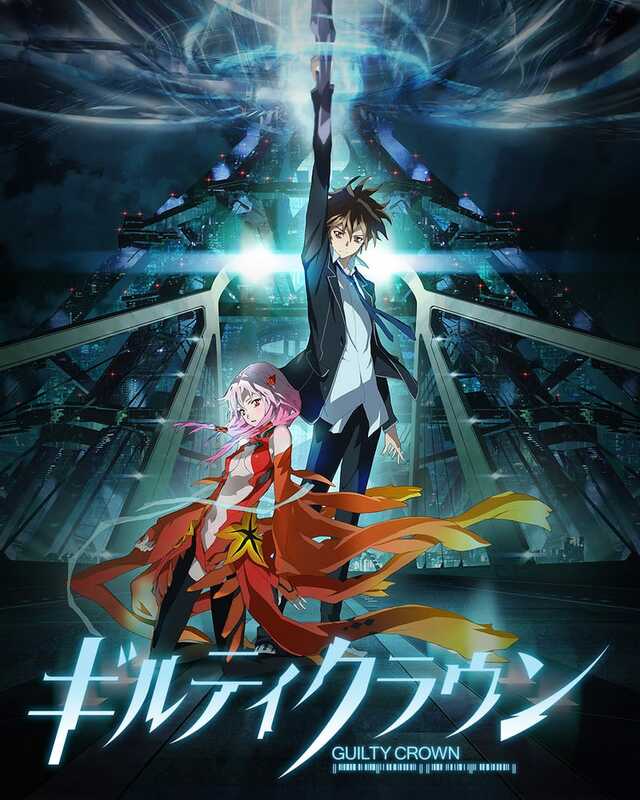 Guilty Crown has a powerfully presented and beautifully conceived series that tends to suffer from a rushed and predictable plot. The characters don't get fleshed out all the way because most of the series is focused on advancing the serial plot. The world is well conceived, but it relies on this universe's unobtainium for everything. I didn't find this a problem, but some people may get miffed by the seemingly all-powerful virus that does everything. This is sort of series that people who love to watch a main character's journey would be in to. Most of the beauty of the series lies in the evolution of the lowly protagonist Shu into a "hero", as it were. The trials he face are fantastical and unreal, but his reactions to them are very real. Sometimes he takes it a bit far, but I hesitate to think what I would do in his situation if I were faced with what he was. The popular colloquialism for this series would definitely be, "It isn't the destination that counted, it was the path taken to reach it". Shu's path is certainly a compelling one, and, for that reason, I'd be willing to watch him do it all over again. That, perhaps, is the core of this review. I'd be willing to relive the depressing and predictable plot in order to see Shu evolve into the hero that every story needs. You can watch Guilty Crown for free on Hulu. As usual, I claim no ownership of the images. I'm nearly caught up with the reviews to where I'd like to be as I watch, so these will stop coming out on a daily basis. It seems likely that Eden of the East or Infinite Stratos will be next. Keep on reading and I'll keep on writing.